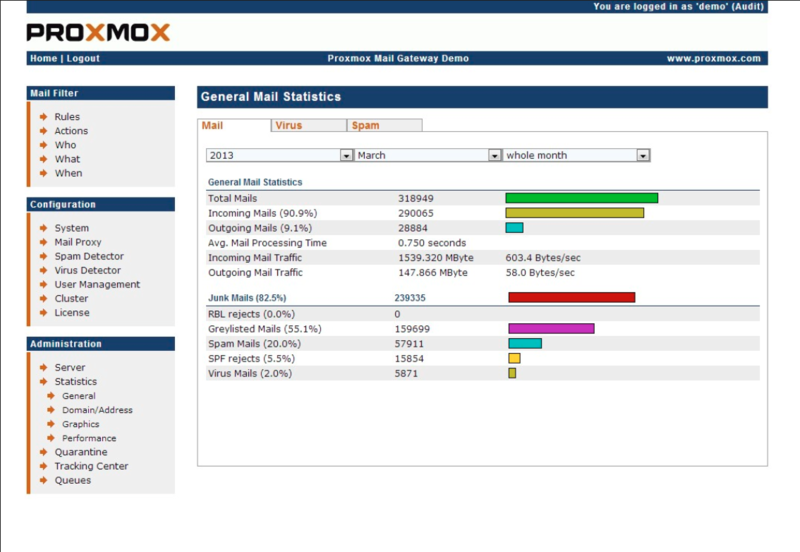 Proxmox Mail Gateway is the leading open-source email security solution protecting your mail server against all email threats the moment they emerge. Organizations of any size can easily implement and deploy the comprehensive anti-spam and anti-virus platform in a few minutes. Deploying the full featured mail proxy between the firewall and an internal mail server allows to control all incoming and outgoing email traffic from the single web-based interface. Proxmox filters the whole email traffic at the gateway before it reaches the mail server and protects businesses against email attacks and other malicious threats. Proxmox Mail Gateway is open-source software, licensed under the GNU AGPL, v3. Commercial support subscriptions are available from Proxmox. The Mail Gateway is a complete operating system based on Debian Stretch 9.5 with a 4.15 kernel. The anti-spam and anti-virus filtering solution functions like a full-featured mail proxy deployed between the firewall and the internal mail server and protects organizations against spam, viruses, Trojans, and phishing emails. The new Transport Layer Security (TLS) policy provides certificate-based authentication and encrypted sessions. Users can now set a different TLS policy per destination domain, in case they need to prevent e-mail delivery without encryption or to work around a broken STARTTLS ESMTP implementation. Configuration of the TLS policy can be done via GUI. TLS is also possible on internal SMTP port/traffic.